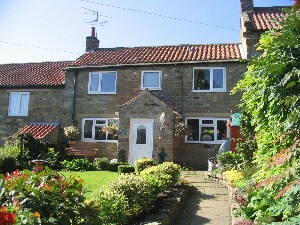 Grewelthorpe had a reading room and billiard room which was situated in the village near Crosshills.It is a small cottage which is now privately owned called Greencroft. 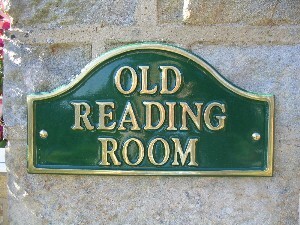 The owners have erected a plaque naming it “Old Reading Room”. The cottage was built about 200 years ago and originally it had a thatched roof.When used as a reading room the ground floor was one large room with tables and benches, there was a stove in the corner.A hook can still be seen, hanging from a beam, which was probably used for an oil lamp.The back of the room is below ground as the building is cut into the hillside.The staircase was at the rear of the room and this lead to a single upstairs room.There were no windows to the back even though this was above ground. The reading room is the house on the far left of this picture of Crosshills. Date early 1900’s. In the York Herald on 13th June 1878 it was reported that Grewelthorpe library had been admitted into the Union of Mechanics Institutes. The Union would provide books which were reviewed quarterly, and a very small charge would be made. 1 guinea per year. 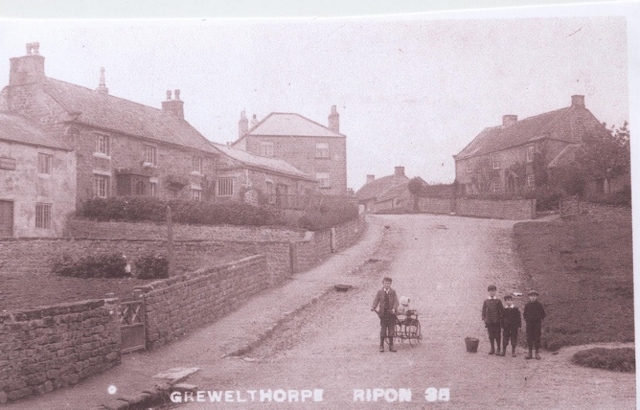 It would seem likely that the reading room in Grewelthorpe was where the library was held.The rooms were only used by the men of the village. They would come to read the newspaper or borrow a book. They would also have a chance to meet fellow villagers and exchange information. During the 1st World War they would read of casualties, and world events. Between the wars the building continued as a reading room. According to the County Directory of 1927, John Metcalfe was the secretary of the Reading Room & Library. In 1932 it is reported that the room was repainted and renovated. Then in World War 2 it became an Air Raid Warden centre. When the stove would come in handy on cold nights, and a welcome cup of tea would be made. A report in the Ripon Gazette dated 29th November 1945 tells us that a meeting was held in the Reading Room instigated by Mr. W.L.Trenholme. to consider the possibility of re-opening the room as a men’s club. It was felt that such a room was needed for use by younger men of the Parish. It was unanimously decided to re-open the room at an early date and a committee was elected. Mr.George Thirkill. was Hon. Treasurer. It was agreed that several repairs and alterations to the room were necessary. The cost of these was estimated at £50. The annual subs were fixed at 10/- with a discount of 1/- for those who paid their subs in full at the beginning of each financial year. It was reported in October 1947 that The Annual Meeting of the Men’s Club was held in the Reading Room. The Chairman,The Rev. Goss reported that they had had a successful year. Officers were elected. Chairman. Mr.A.Chamberlain. Hon. Sec. Mr. G.R.Harrison. Hon Treasurer. Mr. George Thirkill. Committee. Messrs. J.E.Thorpe senior. J.Thorpe junior. W.Goundry. R.Thirkill. L.Taylor. D.Lofthouse. F.Taylor. Sub Committee. C.Fox. K.Ward. M.Harland & W.Richmond. Reported February 1948. The Men’s Club held a whist drive, arranged by the Secretary G.Harrison. They raised £4.3s.6d. In March 1948 the Men’s Club held a social in the school. £16 was raised for funds. 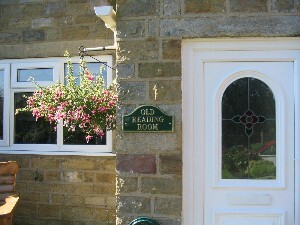 The ladies of the village made the refreshments.The room continued as a reading room with a games room above. The upstairs room had bench seating all round, with a darts board and a billiard table.Gordon Ryder who was born in Grewelthorpe in 1937 tells us that his Mother was the caretaker of the Reading Room. She would tidy up the books, light the stove each day and she would, with his help, iron the billiard table. The pay was £1-10 shillings a month. He thinks this was in the late 1940’s and early 50’s. The reading room was sold in 1965 for about £250 the money from the sale was placed in trust and a charity known as The Reading Room Trust was formed.The trustees were village residents and they represented various organisations within the Parish. They met once a year and they made donations to worthy causes within the Parish which were of benefit to the whole community. They only spent money made as interest on the original investment. Quite often a donation was made to go towards the upkeep of the churchyard. Money was used to buy the tables which are kept in the church for use of the village. Money was also spent on the old school. 25 September 2018. Over the last couple of years or so the Trustees have been giving thought to whether or not the Trust has outlived it’s usefulness & should be closed down. At their meeting on this date the subject was again brought up & it was unanimously agreed that it should be closed. This was put in hand & the total assets i.e. cash to the value of £736.16 was split between St James’ & Methodist Church & Grewelthorpe Village Hall on the understanding that it should be put towards the maintenance/refurbishment of the respective buildings or, in the case of the Church, towards upkeep of the Churchyard. I would be interested to hear from anybody who has a story to tell about this old building. Perhaps somebody knows when the reading room started and when the games room was created and what the building was used for before then. Researched by Barbara Bradley & Sally Marr. 2007. Updated 2018.